ART Grand Prix Team is preparing for the debut in DTM series and completed first set of tests at Portimao circuit in Portugal with Mercedes AMG DTM cars. 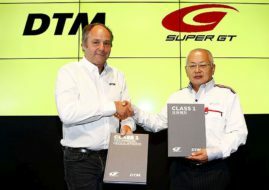 The outfit managed by Frederic Vasseur joins the DTM this year to become the third team to compete under the banner of the brand with three pointed star. For this test, team leader Gary Paffett handed over his Euronics Mercedes-AMG C 63 DTM to the two rookies, Lucas Auer and Maximilian Gotz. ART Grand Prix had a very tough time at their first DTM test. Technical problems presented the team with some challenges which they were able to master during the day, finding out some valuable pieces of information on the way. Gotz and Auer were both planned to spend a day and a half in the car, but after difficulties of the first day, rookies completed one full day of testing each. “Max is very experienced with GT cars thanks to his years in the SLS AMG GT3. He was able to give us excellent feedback and drove us if he had spent years in the DTM. Lucas has had more experience with single seater cars and had to learn track first, so many things were new to him. But, he steadily improved during the day”.